I wasn't able to get any flying done this past weekend, on Saturday the overcast was too low but I went out to the airport anyways because they were having an open house, talked to a few people and checked out some of the planes. On Sunday the wind was gusting to 35 - 40 kts so flying was out. I took Monday afternoon off work so I could do my next lesson, stalls. As always Dave started off the lesson with a prebrief to go over what we'd be covering. This usually takes 20 - 30 minutes. We went over the definiton of a stall, the different types of stalls, the warning signs and most importantly, how to recover. We also went over some of the safety aspects of the lesson, HASEL checks, minimum height requirements etc. The idea of this lesson is to identify the early symptoms of a stall and prevent them from occuring, also to teach recovery techniques if you find yourself in the middle of one. Practicing stalls at 3,000 plus feet is fun, having one happen at a few hundred feet AGL on final, while your paying attention to a handful of other things can be very serious. Most small general aviation aircraft wings stall at an angle of attack of 16 - 17 degrees. Stalls can happen at any speed and at any attitude. As a pilot it's very important to recognize the symptoms of a imminent stall, as they are most likely to happen when your low and slow, during landings and takeoffs. Some of the symptoms of a imminent stall is buffeting, an aerodynamic vibration caused by the airflow starting to detach from the wing surface. Another obvious symptom is of course the stall warning buzzer, which is set by the manufacturer to sound just before your the wing stalls completely. With the prebrief done I went outside and did the external part of the preflight, she needed fuel. Since it was cold and I only had a light jacket on I went back inside to find out what was taking Dave, and to get some warmth. I found him and back outside we went, short trip to the fuel pump, and back outside again to fill her up. Dave somehow managed to break the clip off pump's ground cable during this process, so he headed back inside to let them know and I jumped into Fern to keep from freezing. Alright, all that out of the way. Dave returned and it was time to finish the preflight, surprise... surprise... a new checklist. My previous flight instructor had a great checklist, one created with the student in mind. Somehow this checklist has vanished and Dave is trying to find or edit (not sure which) a checklist that works for him. All the checklists are basically the same, check this and confirm that, but the steps can be in a slightly different order and they can be divided up differently too. I like to get a much as possible done while still on the apron, then once we're on the runway a few final checks and then we're good to go. I'm thinking about creating my own checklist, one that works for me and doesn't change week to week. Of course if I decide to do this I'll have Dave review it and make sure there are no errors or missing items. Preflight done, I taxi us out to the runway 21, backtrack a bit, turn us around and off we go. Takeoff was fine and I closely watch our heading to minimize our drift to the left. I let the nose get a bit too high on our climb out, Dave called me on it just as I'm about to lower it on my own. I quickly get her trimmed and make a climbing turn to the northwest, calling tower to let them know. To start things off Dave had me put us into slow flight, which I did. He then took control and demonstrated a power off stall with a flawless recovery, I then attempted to replicate. My first stall went fine, pull the power back, hold the nose up to maintain altitude, hold it, hold it, nose is starting to get high, stall warning buzzer starts wailing, then the nose drops nice and gentle, I recover by feeding in some forward yoke while bringing power back up. Sometimes I feed in too much forward yoke, but I'm learning. I did a few more power off stalls for practice, during one of these we had a wing drop, Dave quickly brought it back up with the rudder. Most non pilots would think that you'd bring the dropping wing back up with ailerons, turning the yoke and lowering the aileron on the dropping wing increases it's angle of attack even more, and can be a very dangerous mistake to make in a stall near the ground. You must bring the wing back up by using the rudder to yaw the plane, basically this causes the airflow to increase in speed over the dropping wing giving it more lift while at the same time you reduce the speed of airflow over the higher wing reducing its lift, this levels you out. Next we moved on to power-on stalls, Dave started off by demonstrating one. The nose drop is much quicker compared to a power off stall. I give it a try. Stalling a plane with the engine generating a good deal of thrust it difficult to do. It requires a lot of backpressure on the yoke, I'd estimate about 40 lbs worth, and the aircraft's nose is really pointed skywards. Once the nose decides to drop, it's pretty abrupt and recovery is quite quick. Dave had me do a few for practice, as with the power off stalls I tended to input a bit too much forward yoke. Since the cloud cover was only about 3,500 feet and we were too heavy for Dave to show me the thrills and joy of a spin, which is what we are going to be doing during our next lesson, we started back towards the airport. I called tower and made a turn to the west to line us up for a straight in approach for runway 21. Landing was pretty good, I did balloon slightly but I compensated just as Dave called me on it. Another good lesson in the books. I can't believe the weather we're having this winter on the east coast, right now it's +10 degrees (50 F). We had a bit of snow back in the middle of December, but it's long gone and we've had nothing since, it hasn't been cold and I think my lawn is turning green. The forecast calls for it to be even warmer tomorrow... this is the weirdest winter I've every seen, but I'm not complaining. I had my oil tank filled last month (it needed 3/4 of a tank) and it cost me $500!, so every day it's warm like this instead of -20 saves me money which leave more money for the flying budget. Speaking of my flying budget, I had hoped to add a few bucks to it again this week but my car needed rear brakes, which surprised me because it's only two years old (Altima 3.5SE with 50k KM) so that took $200 of my hard earned money that could have been put to better use in my flying fund. 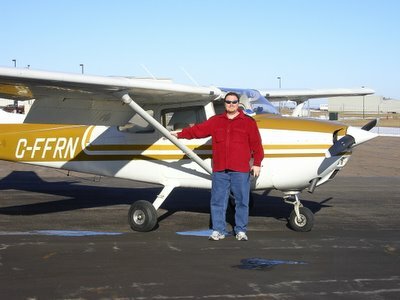 Here' s pic of me and the Cessna 172 that I'm doing my flight training on. I've named her Fern because of her call letters and the splash of pretty green. My instructor took this pic on January 8th, just before our slow flight lesson. It was a beautiful day for flying. Didn't get out flying on Saturday due to crappy weather. Sunday I was up early to coach my son's hockey team. The sun was just coming up and I didn't have time to check the metar, I took a look outside but I'm not great at judging cloud height and it was still pretty dark, so I wasn't sure what the day would bring. Our hockey game went well and when I walked out of the rink I was greeted by a sunny and nearly clear sky... so I called Dave as soon as I got home and booked a lesson. I arrived at the airport about an hour later and chatted with Dave for a few minutes, did the prebrief and I went out to the hanger to preflight the aircraft. The preflight went well but they must have just changed the oil, as it was pretty clear and it was hard to tell what the level was at first, in the dimly lit hanger. After I realised that the oil was nearly clear instead of the usual black, I was able to determine the level, she was good to go. Pushed her outside and snapped a couple of pics, hopped in and finished the preflight using the checklist, called tower and then taxied out to 28. This takeoff was much better than my last one, although I did rotate a bit early and I got a little wobble from the front wheel just before liftoff. I quickly trimmed her for a nice climb at 80 mph and made sure I kept a bit of pressure on the right rudder to keep us straight. I was much happier with this takeoff. We flew to the northwest at 3,000 feet and started things off with a 20 degrees of bank turn. Halfway through I noticed that I had gain a few feet (less than 50) and I was able to correct early so that by the time I finished my 360 I was back at the height I started at. I then did a 30 degrees of bank turn the other way, this turn is much faster and more back pressure is needed to maintain height. It's funny how you can get used to things, at first I found a 30 degrees of bank turn to be very steep and a bit exciting, now they just seem like a normal turn. A 20 degress of bank 360 takes forever. Next we practised flying for endurance. I already knew from my previous lesson that flying for endurance is achieved at about 1,800 rpm, but this was a colder day and there was less fuel in the tanks so Dave had me started off at a cruise rpm, I then brought the throttle back 100 rpm at a time, trimmed to maintain altitude and repeated. VFE was achieved a couple of minutes later at slightly more than 1,700 rpm. With this review out of the way we started on today's lesson, slow flight. The definition of slow flight is flight that is just above the stalling speed and below the speed for best endurance. We did our HASEL checks and then Dave slowed us down from normal cruise to slow flight, he went thru the characteristics (poor forward viability, sluggish controls etc.) then brought us back up to normal cruise, then he had me do the same. We practised slow flight with and without flaps. Dave then had me do some turns in slow flight to get a feel of the aircraft. With today's lesson in the books we touched on our next lesson, stalls... by doing a couple of them. It was kinda cool to see the airspeed indicator drop below 40 mph, stall horn wailing. Doing something like this a few lessons ago would have caused a "pucker" moment for sure, now it's just new and exciting. We headed back to the airport just as traffic was starting to pickup. A Mooney had just taken off for Moncton. I called tower to let them know we were inbound for the cz and that we'd being doing a straight in approach for 28, (the active into the wind runway). I asked them for a traffic and airport advisory, they replied that a Dash 8 was on short for 03. there was also a 737 about 15 minutes out coming in for a straight in approach for 03. A few minutes later we were on final for 28, by this time a cherokee called tower, they were on the apron finishing their runup. A couple of months ago all this chatter would have totally confused me, but I was able to pretty much visualize where everyone was. Dave then called tower and informed them that we were going to do a touch and go to the circuit, which was news for me. Tower asked if we were going to do some circuits, Dave replied that we'd just do the one touch and go and that we'd be doing a full stop after that. I setup for landing, it was a bit choppy so I was kept busy on the yoke. Reduced power maintained altitude to bleed off speed, flaps to 20 degrees, trimmed for glide slope, maintain speed (65 mph), watch for correct slope etc. All this keeps me pretty busy, juggling everything at once, the choppy conditions didn't help either. It was a decent landing with Dave adding some assistance on the yoke. I find our decent during the last fifty feet steep, so I have a tendency to flare a bit early, this is wrong and I must remember to stop doing this. We slowed to about 30 mph or so, Dave put the flaps back up and then pulled off the carb heat and I went to full power and we took off. I brought us backup to circuit height and did the circuit. My next landing was perfect, at least from my standpoint. This time I fought the urge to flare early, brought us down with Dave talking me through it the whole way. After we touched down (gently) Dave informed me that I had done that landing by myself, he didn't provide any assistance on the yoke. I was so busy landing the plane I hadn't noticed that he wasn't helping me. This was my first landing all by myself, without any "hands on" assistance from my instructor. I felt like a million bucks.... I'm still smiling. I know that this is getting repetitive, but another great lesson! Two good things happened yesterday. First, I recieved word from Transport Canada last night that my class three medical has been processed and I should get my certificate in a week or two via mail. Michelle at civil aviation (TC) has really been great to deal with. I had one minor snag but it's all good now. Second, we watched our Canadian junior hockey team beat the Russian's five zip. My son and I watched the game until the end of the first period when he had to go to bed, but he came back out to see the replays of the third and forth goals. I admit I love hockey, but I sometimes worry that he's becoming a bit of a fenatic. I help coach his team, he's big and quite talented so I'm of course supportive. (At six he can skate backwards faster than most kids on his team can skate frontwards). Anyways back on topic. I booked my next lesson for Saturday morning, looks like the weather might be iffy though, Sunday looks better so my chances are pretty good that I'll get a lesson in. I'm gonna snap a few pics so I'll post some of those as well. I didn't get a chance to do any flying over the holidays, I would had liked too but I was so busy doing other things... the weather wasn't great for it anyways. We had a few family "get togethers" here on the island, then we went to Cape Breton (6 hour drive) to spend a few days with my brother and his family. The kids all got MP3 players for Christmas and the wife and I were out early boxing day and managed to pickup a nice portable dvd player. So the drive over and back wasn't too bad as the kids watched a movie each way and listened to their music. We came home on new year's eve to ring in the new year at the inlaws. The kids had a blast, we picked up some fireworks on the way home and set them off just before midnight. I hope that everyone had a great Christmas and a safe new years... and that the weekend weather is nice for flying.